Naagin 17th April 2016 Part 2: Naagin Sunday’s episode is divided into two parts because of the lengthy episode; The first part reveals the Sesha evil plans against Shivanya and the second part includes their furious fight. Sesha makes a plan to kill Shivanya by making her consume poisoned milk. She justified Yamini that she could do anything to get her love. Shivanya prays that half truth should never come in front of Hrithik. Yamini comes with the poisoned milk and offers it to Shivanya; she assures her to have it after the fast. Hrithik was about to drink it, but Shivanya saves him from not doing so. Shivanya shows her insecurity because of Sesha. Hrithik goes happy and starts dancing with her, which makes the milk falls and Sesha goes angry of seeing this. Shivanya confesses with Sesha that she is giving up her Naagin form to live as a human for the rest of the life with Hrithik. The next plot Sesha had planned was of getting Hrithik think that Shivanya is fighting with his mother. She makes a successful fight with Yamini in the house in the Shivanya’s form. Hrithik returns and starts scolding real Shivanya in a belief that she was the culprit. In no time, Shivanya figures out that it was none other than Sesha, she wonders for the reason she was doing all this. Shivanya apologises to Yamini to save her marriage. Yamini comes to Shivanya and assaults her with the ring. She confesses that she knows it earlier that Shivanya is the Naagin in the house, they both planned to expose each other. Yamini admits in front of Shivanya that she was the one who killed Hrithik’s parents and doing all this to get the Naagmani. She dares her to tell him that she was the murderer, and he will throw her out of the house. Shivanya took the pledge to herself that she will expose her at any cost and will not let her get the Naagmani. 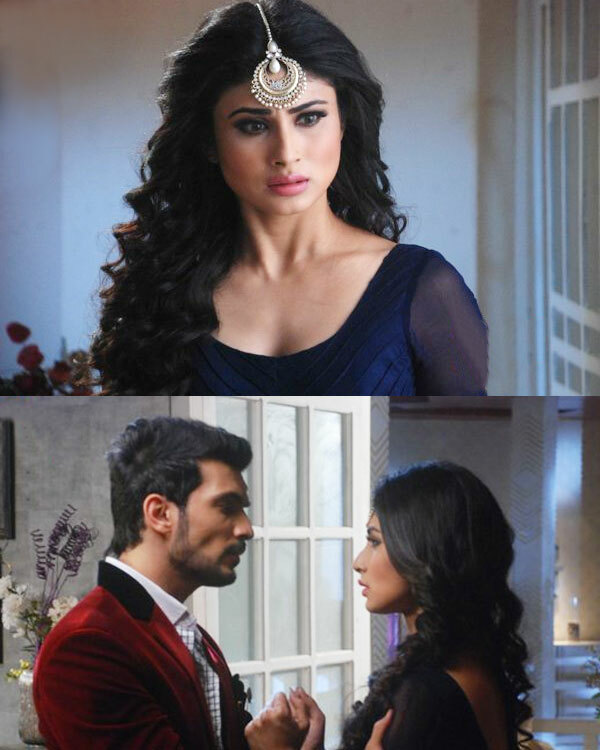 Next morning Sesha believes that she will get the Naagmani and its powers easily, Shivanya standing outside the cave wonders to figure out something to stop the pooja. Yamini, Sesha, and Guru Maa begin the pooja while Shivanya was not able to enter as the gate was blocked. Getting blessings of Lord Shiva, Shivanya fires the cave and disrupts the pooja. She was able to come the cave successfully after Guru Maa calls her hawk inside. Shivanya and Sesha had an emotional argument thereof. Sesha describes her feelings towards Hrithik as she loves him more than anything. Shivanya then remembers how in childhood shesha had bitten her, and how her mother had given her antidote to shesha’s poison. She believes that her mother had forseen all this. They got indulged in a furious fight and Yamini goes happily after seeing this, Guru Maa decided to escape before the fight goes over. Guru Maa makes the web around Shivanya and they all three watches this happily. Shivanya makes her last call to Sesha to back off, but she didn’t listen and moved forward to spend Suhag Raat with Hrithik. Click here for Naagin 17th April 2016 Part 1.